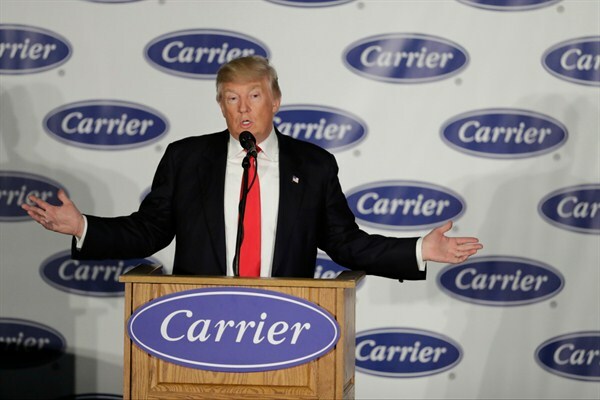 President-elect Donald Trump at a Carrier plant in Indianapolis, Dec. 1, 2016 (AP photo by Darron Cummings). When speculating about President-elect Donald Trump’s likely economic agenda, one must return to the popular view among many American voters that to create jobs and repair an ailing economy, turn to successful businessmen. Only they, not the professional political class, have the practical experience, instincts and strength needed to muster up better economic performance and job creation in areas like manufacturing. Why? Their business successes, according to this view, are easily transferable to solving a wide range of problems in the public sphere.